chronicling the historic WWII experiences of a young RCAF Pilot Officer. 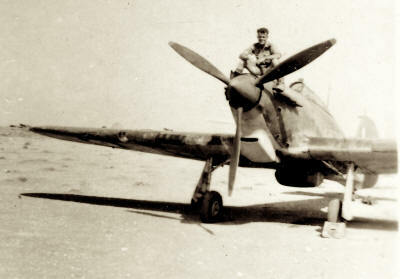 Don lived an adventure many young men had hoped for, piloting his beloved Hawker Hurricane with RAF No. 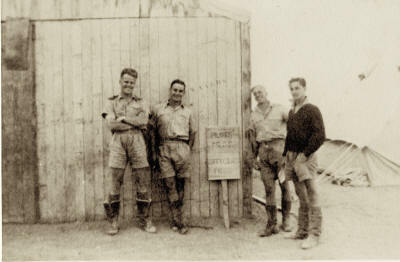 33 Fighter Squadron in the Western Desert. 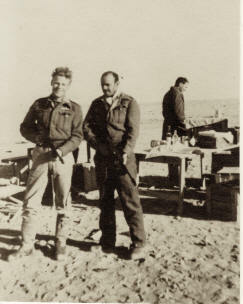 In this book he chronicles not only their missions, including Operation Crusader, but a spirit of life, camaraderie and loss, at North Africa Landing Grounds. When the author himself is shot down and crash lands, he witnesses the starkly brave act of a true friend, L.C. Wade, putting his own life on the line for his. The ensuing years in captivity, coupled with skill and good fortune, provide a unique view of life in the hands of the Axis powers. He shares his good nature and humour, allowing a glimpse into 'what it was' that got these men through it all. Don Edy and Lance Wade with "Tommy Guns"
Weeks later aboard the S.S. Ariosto, a crude prisoner ship, they were torpedoed in the night. Injured when the blasts blew him from the sealed hold, he was able to time his leap into the debris-filled water and survive semi-conscious for hours. 138 fellow prisoners died. He is one of the few eyewitnesses to the disaster. 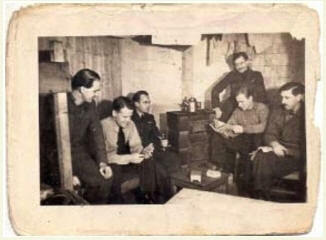 His final years as a prisoner of war were spent in the infamous Stalag Luft III in Sagan, Germany. 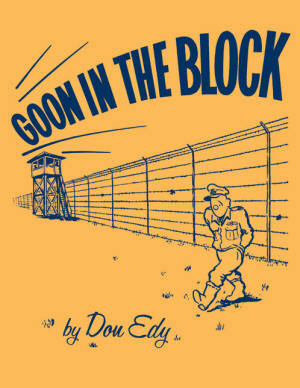 "Goon in the block" was the cry set up whenever a German guard entered the prisoners' barracks. The name, "Goon", given to the Germans came from the comical appearance of the guards up in their sentry boxes. In the wintertime they wore enormous long greatcoats, heavy caps with a scarf wound around the neck and lower face, thick gloves and huge fleece-lined boots. With nothing but their eyes and noses showing they looked for all the world like Alice the Goon in the old Popeye comics. Don has the rare ability to make a journey through war relatable, shaping eyewitness accounts with insight and context. This book is a unique glimpse-in-time from Egypt, Libya, Italy and Germany, to fighter missions, inhumane mass prisoner transit, Axis POW camps (including the monastery at Padula which is now a world heritage site) and it is one of the few chronicles of the Forced March itself. 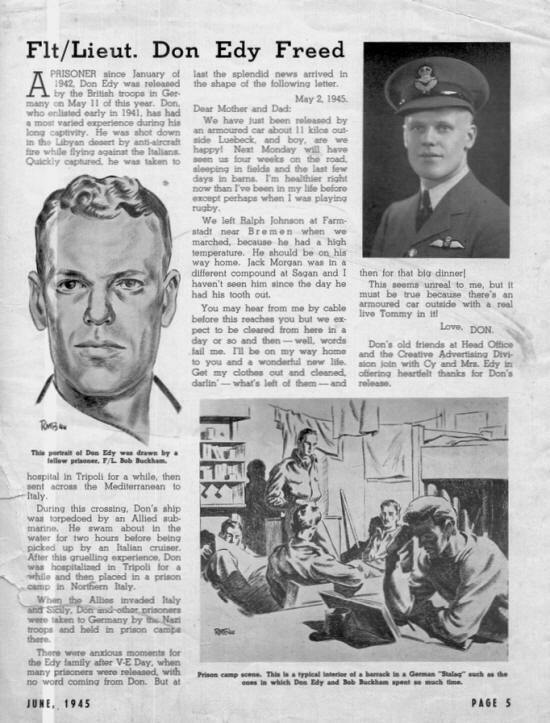 Portrait of Don Edy sketched by fellow prisoner at Stalag Luft III featured in 1945 article. In 1948 Don wrote: "This story was written primarily for my family and for my children. I found that I could not tell the family all that happened by just talking from time to time. 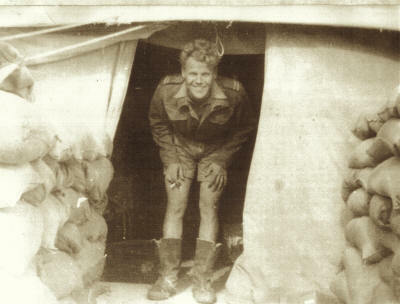 I realized that by the time the children were old enough to understand, and would want to know what I did in the War, I would not be able to tell them. Some of my friends, have intimated that the story might be of Public interest. Maybe it would, and if enough people think so I might re-write it again with that in mind." And so he has. 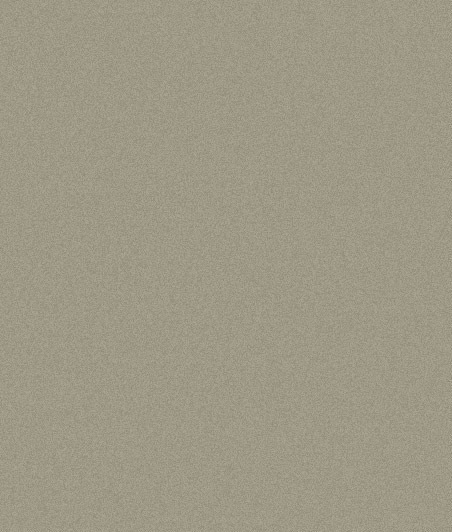 If you know the history or whereabouts of any 1941 No. 33 Squadron personnel, please contact Don.